The Baltic seabed, littered with war debris and shipwrecks, has fascinated historians and researchers through the ages. But the underwater search robots they use pose problems by further disturbing the silty waters with their propeller movements. Estonian engineers say they may have found a solution with their latest invention — a small, propeller-less underwater robot that causes minimum disturbance and lowers the risk of damage to submarine archaeology. The unique feature of the U-CAT, about the size of a vacuum cleaner, is four silicon flippers inspired by streamlined sea turtles' arms and legs. "They move in a slow and quiet motion and won't bring up sediment from the [sea] bottom," says Taavi Salumae, a designer at the Biorobotics Center of Tallinn University of Technology. The underwater probe has been developed since 2012 in the EU-funded Arrows project that focuses on new technologies for marine research. It can stay submerged for four hours at a depth of 100 meters (330 feet) on a single battery charge of two hours. It's equipped with a camera and lights. Most importantly, it can easily be rotated in tight spots that are too dangerous or difficult for human divers. 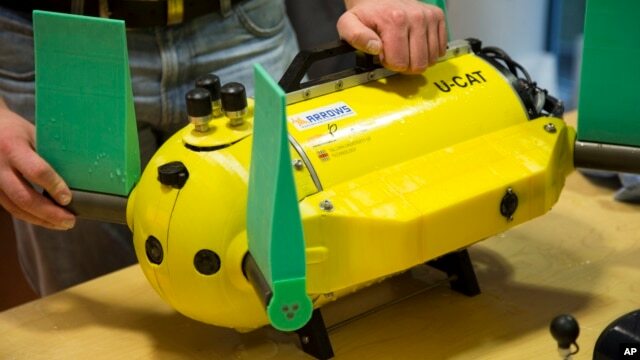 Salumae says the U-CAT, an acronym for Underwater Curious Archaeology Turtle (winner of a Facebook contest to name the robot), is one of the first robots designed to go inside shipwrecks and help underwater archaeologists study interiors of locations.